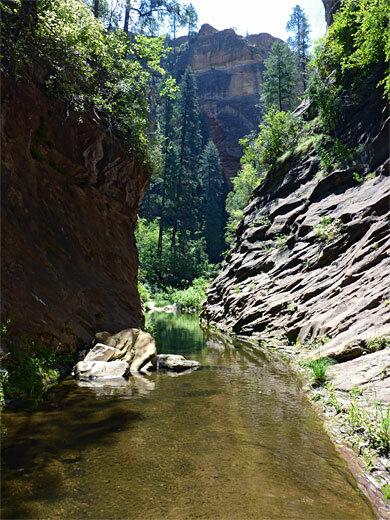 The most popular trail in the Sedona area is along the lower end of the West Fork of Oak Creek, a stream that flows year round through a deep, forested canyon, quite narrow in places, containing many pretty eroded rock formations and plentiful wildlife. The carpark at the trailhead is set in a clearing next to a grassy meadow which in summer is filled with wildflowers of every color and frequented by humming birds and large butterflies; a most attractive sight. The official trail is 3 miles long but beyond, the canyon extends for a further 11 miles, and is one of the best all-day hikes in Arizona, assuming transport is available at the upper end. A few places in the stream may require swimming but there are no serious obstacles, though for some, two days may be required for the complete trip. 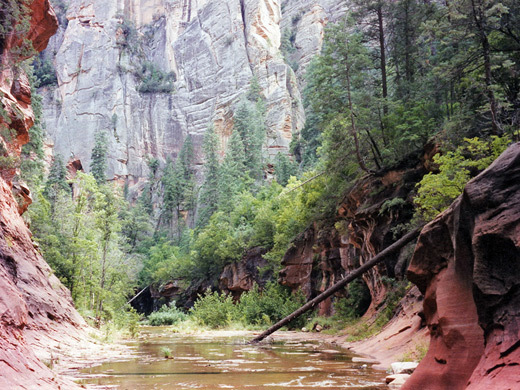 The West Fork joins the main Oak Creek canyon near its north end, about 6 miles south of the point where highway US 89 descends from the flattish, densely-forested land that extends south from Flagstaff into the red rock country around Sedona. The designated carpark at the trailhead is a little south of milepost 385. US 89 is narrow, winding and offers only a few places to park at the roadside so most visitors to the West Fork are obliged to pay $10 (2019) to use an official carpark at the trailhead. 7 views of West Fork of Oak Creek. TopoQuest topographic map of West Fork of Oak Creek. From the carpark, a path crosses Oak Creek and follows it downstream for a short distance, passing through the site of a ruined settlement, evidence of which includes overgrown remnants of fireplaces and stone floors. Also nearby is an unusual cliff house, and all structures are part of the early 20th century dwelling of Mayhew Lodge, long since abandoned. The official trail starts just beyond, near the West Fork confluence - a three mile route that is well-used, and marked by distance indicators every half mile, although the signs at 2.5 and 3.0 miles are not obvious. 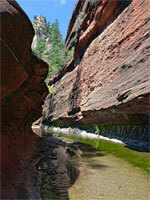 The canyon is hundreds of feet deep and moderately narrow from the start. The streamway is wooded, overgrown, shaded, and filled by many fallen trees and old logs, often lying across the creek. The path crosses the stream many times and is occasionally difficult to follow, and in places there are paths at both sides. 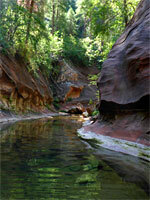 Wildlife is quite abundant, principal inhabitants of the canyon being butterflies, birds, squirrels, lizards and snakes. Red is the dominant rock color - most of the cliffs are composed of reddish-orange Coconino sandstone, topped by white Kaibab limestone much higher up. 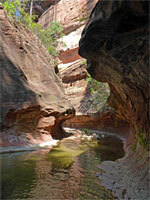 The sandstone rocks are multi-layered, often eroded into many curving shapes and forming frequent short, tunnel-like passages around the streambed, similar to the famous Subway of Zion National Park. Occasionally the creek has pools 3 to 4 feet deep which harbor trout and other fish although usually the water (in summer) is only a few inches deep. The stream flows gently, and the hike is very pleasant and relaxing, and cool since only occasional sunlight reaches the canyon floor hence the trip is ideal for the hot summer months. The trail is nearly always level and close to the stream, until near the 3 mile point where it climbs steeply above the water, traversing a wooded hillside, then drops down to a stony area in mid-river, a point which marks the end of the official path. Ahead lies a 50 yard, tunnel-like channel flanked by sheer cliffs at either side and filled by water usually no more than one foot deep. Thereafter the canyon is not much different to before - the stream forms a few large pools (some over 6 feet deep, although the deepest wading required over the first few miles is only 3 feet), frequent cascades and small waterfalls, always with eroded, curving rock formations rising above. Fish are more plentiful, their size proportional to the depth of pool. About half of the time is spent wading through the river, and half walking along the river banks, where a distinct path persists. Overhanging cliffs provide occasional sheltered areas for camping and fires, away from the water. The canyon does not become noticeably narrower, just gradually less deep, though also more overgrown in the upper reaches. It is possible to continue all the way to the upper end of the creek, and meet with dirt roads in the Coconino National Forest, though this is a strenuous 14 mile trip, and usually involves some swimming of deep pools as well as much wading and boulder scrambling. One target for a day hike is the first major side ravine (Barney Spring Canyon) - also narrow, but filled with bushes, boulders and trees so difficult to follow, this joins from the south about 6 miles from the start of the trail. The 12 mile round trip to this point takes at least 5 hours.